Freedom Unsinkable. - Mississippi Believe It! Home » Resources » Campaign » Freedom Unsinkable. They tried to blow a hole in our freedom. Instead, they helped make our freedom whole. On October 12, 2000, the USS Cole suffered a devastating blow – a strike literally against our freedom. And it was perpetrated by the same terrorists who masterminded and executed the attacks on New York and Washington, D.C., on September 11, 2001.Through both incidents, we proved that our freedom is unsinkable. The men and women on board the USS Cole that fateful day epitomize that freedom. Some became heroes that summoned all the strength and wisdom necessary to wrest the USS Cole from the depths of the sea. Other heroes on board did not survive that day … and paid the ultimate price for our freedom. We salute them all. 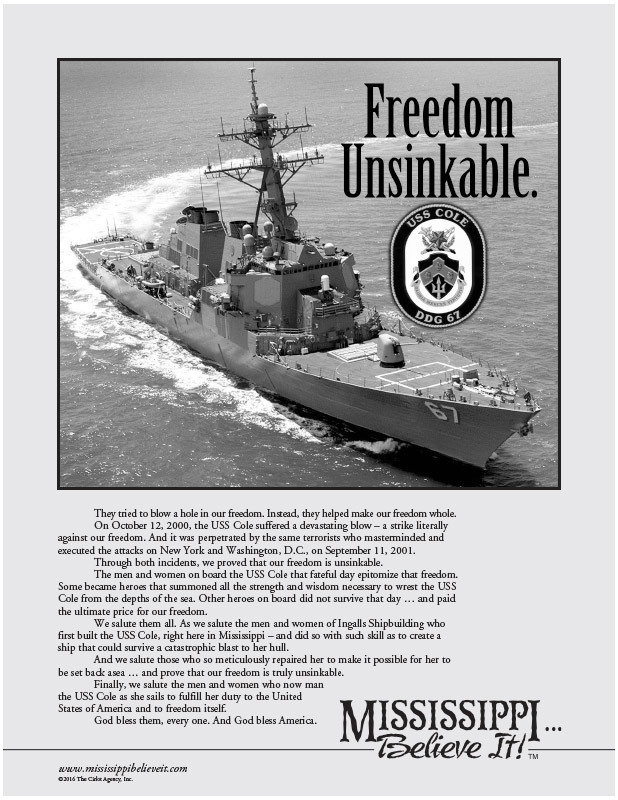 As we salute the men and women of Ingalls Shipbuilding who first built the USS Cole, right here in Mississippi – and did so with such skill as to create a ship that could survive a catastrophic blast to her hull. And we salute those who so meticulously repaired her to make it possible for her to be set back asea … and prove that our freedom is truly unsinkable.Finally, we salute the men and women who now man the USS Cole as she sails to fulfill her duty to the United States of America and to freedom itself. God bless them, every one. And God bless America.